Smile scans performed by automated machines are given daily to workers at Keihin Electric Express Railway in Japan. The software is provided by Omron Corporation (see the earlier article OKAO Vision Lets Machines See You Smile). OKAO originally developed their smile recognition software for use in cameras or other consumer devices to help the camera focus on smiling faces, which tends to be what people want their cameras to do. Keihin Railway workers, on the other hand, are forced to submit to the "smile police machine" every morning when they come to work. The Omron software checks a variety of facial characteristics, and then ranks the smile from 0 to 100; the consumer version describes this ranking as "percent smiling". Employees whose smiles fail to measure up are given computerized messages to encourage them to smile better. "You look too serious" and "Lift up your mouth corners" are typical feedback. The workers also receive a printout of their daily smile, along with its smile ranking; this paper is kept throughout the day for purposes of inspiration. SF fans are maintaining poker faces; we recall previous examples of machines judging our apparent mood based on visual or other cues. The Daily Schedule from Frank Herbert's 1977 novel The Dosadi Experiment and the HAL 9000 computer from Arthur C. Clarke's 1968 novel 2001: A Space Odyssey both judge human fitness for duty using voice analysis. I'm guessing that some readers are frowning a bit at the idea that it is now possible for a machine to precisely grade your smile, with the expectation that you will meet a set standard every day at work. Once management has a number for something, it's all over. However, I was actually thinking that an even more sinister motive might be at work. 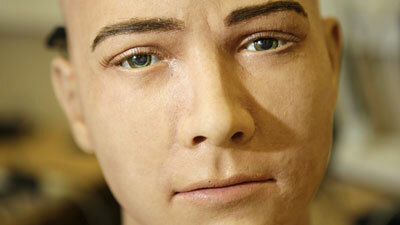 Readers may recall the Jules robot that uses special software to match your smile. Once robots have learned to smile perfectly, the last reason to prefer a person over a robot will have disappeared. Learn more details about Omron Corporation's OKAO Vision. Story from The Telegraph via Futurismic.